In partnership we work with families to respect and promote the values which KIS advocates, so enabling resilient, compassionate and reflective individuals to lead in successfully shaping their world. KIS offers an inspirational British styled education with achievement and aspiration at its heart. With a commitment to continuous improvement we provide outstanding opportunities for students to excel at all age levels. Dedicated staff provide for diverse and creative learning through supportive and engaging teaching, encouraging our students to investigate new experiences and to fully extend existing passions and talents. 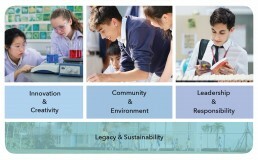 Four value groups underpin the KIS experience, empowering our students to challenge themselves and to achieve their goals in a culture of respect, understanding, compassion and broad mindedness, now and in the future. recognise the importance of honesty, integrity and respect and apply these values in their relationships with others. take opportunities in their classroom lessons and in their planning and preparation to promote the importance of legacy and sustainability. spend time with their children on home-learning tasks. help their children understand how their family life promotes environmental awareness.